Ability to use any XML files as a data sources, retrieve any character or numeric data from them and generate by such data any kind of formatted/hypertext output documents. This features is available in FlexDoc/XML. Using special drivers written with FlexDoc API, it is also possible to connect to any other non-XML data sources provided by a Java application. Such data sources (called Data Source Models (or DSMs) and drivers to them – DSM Drivers) can be processed in the same way as XML-files and allow to generate by them any kind of documentation. See FlexDoc/Javadoc and FlexDoc/Together as rich examples of working with such application-provided data sources. By calling from one template another templates (subtemplates) it is possible to mix data from the different data sources and to generate by them a single documentation files. The involved data sources can be of any possible nature, both XML and non-XML types. Using subtemplates allows to generate from one or more data sources a documentation that consists of many separate HTML files interconnected by a common network of hyperlinks and displayed in separate frame windows. FlexDoc.XYZ supports inserting graphic images into the generated documentation. 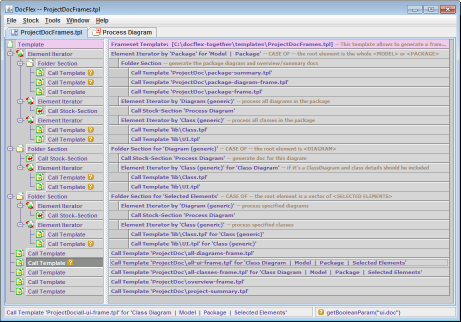 The images can be either taken from the existing graphics files (via URLs, file pathnames or Java resource names specified in the templates) – static images, or generated dynamically by a Java application and, then, provided to the FlexDoc Generator by a custom written DSM Driver (see FlexDoc API for more details). The supported graphics formats include JPEG, GIF, PNG, and WMF. Depending on the selected output format and the generator's settings, the images can be either inserted as the references to the graphics files stored externally near the generated documents (HTML, RTF) or embedded directly in the document files (RTF). See Image Formatting for more details. 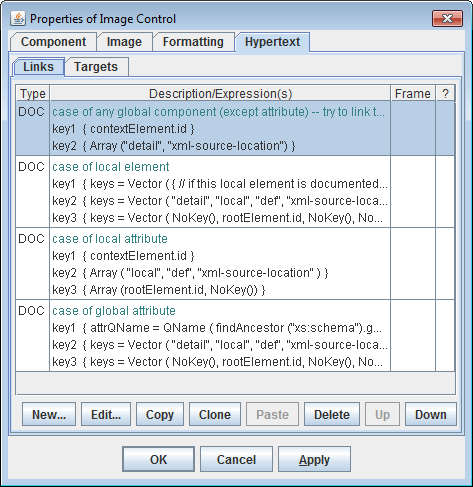 For more information about image support, see also Image Control in Template Components documentation. FlexDoc allows to generate hypertext links between any parts of the generated documentation as well as to the external URLs. The internal links are generated using the special hyperlink source- and target-anchors defined within the properties of template components. Each anchor definition contains specifications for generating the anchor keys. During the first (estimation) phase, by the anchor definitions specified in the templates, the possible anchor positions in the output documents are produced, together with their anchor keys. These positions are stored in a single pool for all generated documents. On the second (generation) phase, when the real output is generated, by each anchor having a match in the anchor pool (i.e. another one of the opposite source/target type and with the same keys), the real hyperlink anchor (source or target) is produced and inserted in the output. A hyperlink source definition may include a name of the targeted frame window (see screenshot above). It is also possibility to define by the same template component several hyperlink sources assigned with different document destinations and targeted to different frame windows (see screenshot above). This allows to load from a generated hyperlink several frame windows at once with the different documents. For images provided by a Java application (via DSM Drivers), it is possible to generate multiple hyperlinks within a single image. To do this, the DSM Driver should also provide a hypertext imagemap for the image. These data types are considered in many situations. For example, when defining sorting of sequences of elements or attributes. 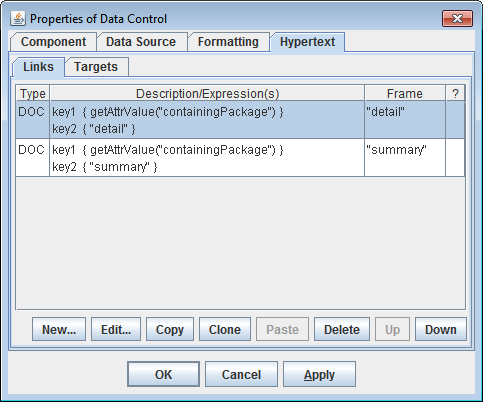 The 'object' data type represents a reference to any Java object and is useful when the data source is provided by a Java applications and represents its internal data. The values of ID attributes are used to distinguish particular elements. 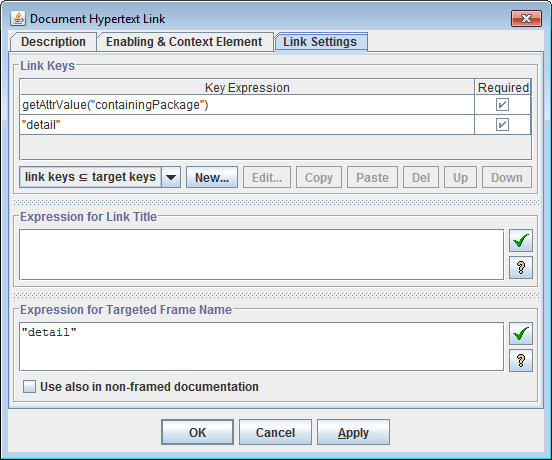 The IDREF attributes can be used to obtain the referenced elements as well as for generation of hyperlinks. Besides this, all values can be arrays of the above types. 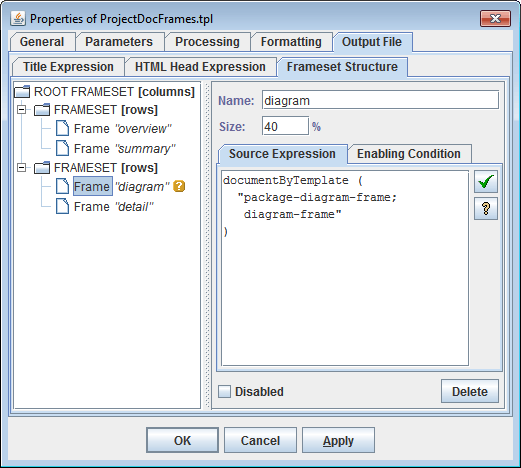 FlexQuery-expressions are small scripts with Java-based syntax widely used in FlexDoc templates to specify all kinds of dynamically computed settings (such as dynamic properties of template components, filter conditions and so on). Each script may consist of any number of statements delimited with semicolons. The last statement should be an expression returning the result value of the whole script. The intermediate statements currently can be only assignments either to local variables (which can be used further within the following statements) or to generator properties. Property access -> or . Each expression may return a value of any Java class type. However, only values of string, number and boolean types (which are equivalent of Java java.lang.String, java.lang.Number and java.lang.Boolean classes) can be processed by expression operators. Values of other types can be only passed as function parameters. More than 200 general-purpose built-in utility functions are now available within the FlexQuery-expressions. Any custom implemented DSM Driver may also register its own utility functions to allow access to some specific features of the underlying DSM. For instance, FlexDoc/Together provides more than 20 additional utility functions which allow to use the functionality specific for Together OpenAPI interfaces. 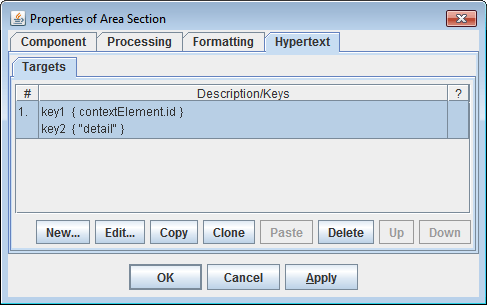 Within FlexQuery-expressions, it is possible to access the template parameters as well as various generator variables organized in the form of hierarchy of objects and properties of Generator Object Model (similar to Document Object Model in Dynamic HTML). where name is the name of an attribute. where name is the name of an attribute whose type should be either IDREF or IDREF (an arrays of IDREF). 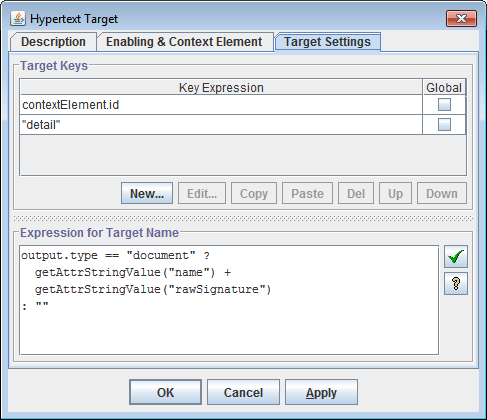 This axis selects all those elements of the XML document (or DSM) whose identifiers are listed in the attribute's value. XPath predicates are replaced with a filter, which can be any boolean FlexQuery-expression. For more information see documentation: Element Iterator | Location Paths. The general data processing scheme employed in FlexDoc consists in organizing nested iterations by sets of elements collected from the data source. Such iterations are specified using Element Iterator template components. In addition to elements, it is possible to iterate by a set of attributes of a certain element or by multiple values of a certain attribute. Organizing iterations by sets of attributes can be useful when the same processing should be repeated for each attribute from the set. See Attribute Iterator documentation for more details. This is the primary method used in FlexDoc to specify collecting elements for iterations. According to it, an Element Iterator is specified with a set of Location Rules. The rule is activated when the current context element has one of the Matching Element Types. Then, the Location Path is interpreted against the context element and a set of new elements is produced. Unlike techniques available in XSL Transformations, Location Rules allow to collect elements not only within a subtree attached to the context element but also to involve in the search the elements accessible via reference attributes (i.e. those with IDREF or IDREFS types). This is achieved by using link-axes (introduced in FlexDoc) together with specifying some Location Rules as recursive (i.e. repeatable an undefined number of times). For more details, see documentation: Element Iterator | Recursive Location Rules. This allows to organize iterations by an arbitrary set of elements provided by an external Java-class. The class should be written with the FlexDoc API. 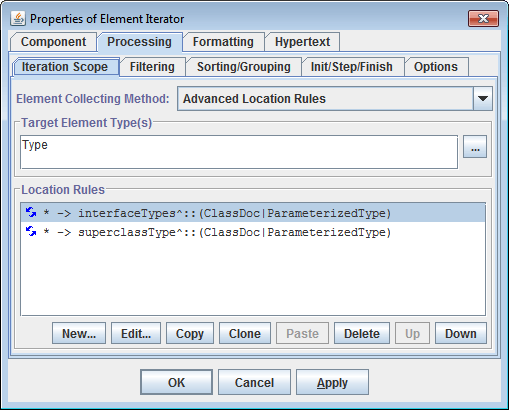 For more information, see documentation: Element Iterator | Specifying Element Iteration Scope. by a specified compound key which may consist of an array of subkeys generated separately for an element. The subkeys may have different data types and different ordering (ascending or descending). Two compound keys are compared by consecutive comparing their constituent subkeys regarding their data types and ordering. by an arbitrary order defined in the Attribute Iterator. Multiple values of a single attribute can be sorted according to the value type. 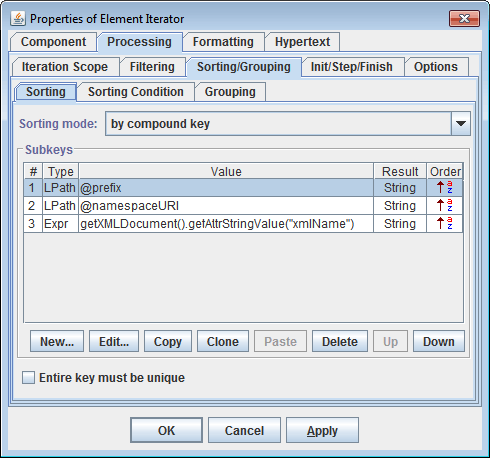 For more information, see documentation: Element Iterator | Sorting and Template Components | Attribute Iterator.